The RPTQ weekend is over and many players are now off to try their hand at achieving their Pro Tour dreams. I will not be one of them, unfortunately. Hopefully Jordan will be (I’ve heard nothing yet). The fact that the PPTQ system requires you to get lucky twice rather than once to actually get the prize is frustrating, to say the least. I’m very annoyed at my performance at this RPTQ, but you cannot let that get to you. Focusing on the frustration will only make it worse and negatively impact future results. You can’t get tilted. The best thing to do is let it go and move on, but that doesn’t come naturally to me. Instead, I pour my anger into analyzing what went wrong and learning from my missteps. I’m not able to leave the past alone, so rather than wallowing in it, I use my frustration to pick it apart until I have an answer and the anger has dissipated. But first, here are the greatest lessons from my trip to the RPTQ. If you’re going to travel in winter, plan for ski traffic. It ruins everything and if you can avoid it, do so. A carful of new Colorado transplants that I didn’t know were going to Utah took the route through the mountains. What should have been a seven-and-a-half-hour drive took them eleven hours. I knew to avoid that route and went through Wyoming instead. Secondly, if you decide to travel in winter by renting a car (because you’d rather not risk your own for the journey) don’t go for anything in the economy listings. I don’t care how much you save, thin tires and short wheelbases are not ideal in the snow. And those things are only at home in crowded cities, not highways. The money is worth less than the years I lost from stress and terror (Semi!!!!!). Just pay the extra for something big with four-wheel drive. As I mentioned, I didn’t specifically prepare that much for the RPTQ. I was more focused on GP Denver and Standard and skimped a bit on Modern testing. I was still playing weekly paper tournaments and getting in some practice on MTGO but no really intense testing. This wasn’t necessarily a problem, Modern rewards experience and I have more experience playing Modern than any other format. Also, as I noted last week, Modern requires fairly rigid gameplay and I knew most of the lines available. Since I knew how I needed to play around or respond to those lines, I felt reasonably confident that I could power through if I got my sideboarding correct. The problem being that my assumption that Jund, Burn, Bant Eldrazi, Infect, and Affinity would be the most popular decks had no proof. I needed some actual data. I arrived at Game Haven Sandy, the RPTQ site, on Saturday just in time to watch the Last Chance Qualifier from round two. I’m not sure exactly what I was expecting, but I was surprised by how much space the place had. The LCQ appeared to have 30 players and they were running three other gaming groups without difficulty. Which I guess is why they were able to get the RPTQ in the first place. Looking around, I was again surprised by how accurate my predictions had been. The tournament was predominately Jund and Burn, with Grixis and Eldrazi tied for distant third. Very little Dredge or Infect. Observing a few rounds and overhearing the conversations of the local players convinced me that this was going to be indicative of the RPTQ the next day. The only thing left to do was go to the hotel and finalize my deck. I had a choice to make between Merfolk or Spirits and Taxes, and sideboards to finalize. Each deck has its strengths and weaknesses, so it was just a matter of determining which would be better at this particular event. Given the expected metagame of heavy Jund, Burn, Grixis, and Eldrazi, I went with Merfolk. It has better matchups against Grixis and Jund than Spirits thanks to more cantrips and a faster clock. It’s worse against Eldrazi because it lacks disruption compared to Spirits. The Burn matchup is roughly even, with Merfolk’s faster clock compensating for the additional disruption from Spirits. With two better matchups, Merfolk was the clear choice. The fourth Path was moved to the sideboard so I could run the third Harbinger, which is normally better against Eldrazi. I had cut the Deprives because they’re now too slow, and the overabundance of Burn made me want some Forge-Tenders. The fact that a lot of Jund decks were on Anger of the Gods was also a consideration. For reasons you’ll see shortly, the only changes I would make if I could do it all over again would be to cut a Rest in Peace for another Forge-Tender and swap the Tectonic Edges for Ghost Quarter. I failed to win a match on the day. Seriously. I lost effortlessly to Bant Eldrazi and the only Affinity player in the room (as far as I was aware). I stayed in because after coming all that way, I wasn’t going to leave after two rounds (and I’d have to pay for my rental for another day anyway). I then proceeded to lose in three each time to both Burn and Infect before giving up. When my deck consistently taunted me with the card I needed to survive on the top of my deck after a land glut in three matches, I can tell when I’m just not meant to play Magic that day. What happened? One factor was that I had really bad variance and luck. My bad variance was how poorly my deck actually performed, consistently not feeding me removal or lands so that I could race. I had the tools to win but not the means. I was also really unlucky with the pairings. Being paired against the only Affinity player in the room is anomalous, but the next two rounds I was the pair up. There were plenty of other winless players and yet I never played any of them. I can take a hint: I wasn’t meant to get a win. What about my own mistakes? Given my playstyle, preferences, and experience, I had the right deck in the right configuration. There was no way, given my own draws, that I could have won my first two matches. I was running very cold and my opponents ran relatively hot. Going back over my notes, I think that had I taken different lines in both games the best I could have done was lose less lopsidedly. In the other two, things aren’t so clear-cut. I had no chance in either of my game ones, but in the game threes I might have won with different lines. My testing against Burn and Infect told me to favor the more conservative lines of play, but in these cases a more aggressive line might have won. Not a guarantee, but it might have happened. It’s hard to call those mistakes because they were based on what worked previously, but the result is unmistakable. It might simply have been that I was an outlier on the data sheet Sunday and I should have taken the statistically worse line to win. You never know until after the fact when that’s true. I did make a mistake against Infect that wouldn’t have mattered if I had ever drawn one of my 12 remaining answers to Inkmoth Nexus. My opponent dipped his hand at one point and it looked to me like he had Distortion Strike. I had boarded in Meddling Mage with the intention of naming Become Immense, but when I saw his hand I named Strike instead. As it turned out he had Become, not Strike, and I made the wrong play because a trick of the lighting made it look blue. I really need to stop deriving information that way—it keeps not working out for me. Remember when I said that smaller tournaments tend to have distorted metagames? That has never been better illustrated than this tournament. We had 50 total players and most of them were on either Burn, Bant Eldrazi, or Jund. I estimated they were two thirds of the total while some others said three fourths, but by any count that is impressive. It looked to me like Burn was the most represented, followed by a tie between the others. It was hard to say for certain, since by the time I was able to look around round two a lot of players had dropped. This was incredibly vindicating for me because those were decks I expected to be huge and I was ready for them. I came prepared for what I was actually going to hit. Things just didn’t work out for me. There was only one Dredge player and the only other blue decks were Blue Moon, so I could have cut some graveyard hate for more Burn answers. For a format that many are decrying as overrun by fast, unfair aggro, this was a remarkably fair tournament. The Infect players got crushed by Burn and Jund, and I saw no actual combo decks. Anger of the Gods drove out the only Dredge deck. Still, the magnitude of the warp around Eldrazi, Burn, and Jund is fascinating. Based on conversations with the other players, it was a combination of metagaming and experience that drove the decisions. 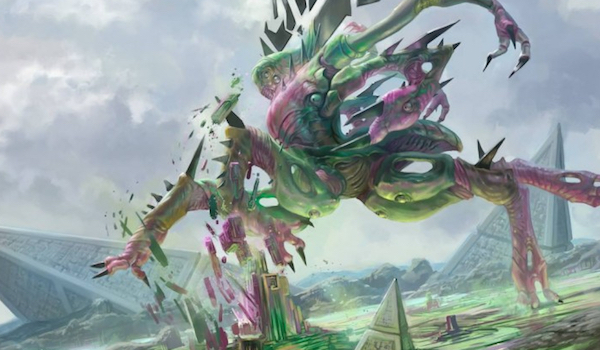 The Jund players were all longtime Jund players, but most of the Eldrazi players were planning to feast on Jund while the Burn players expected more Infect. This is too small a sample to make any judgments, but if the stories coming in from other RPTQ’s are indicative, then we may be seeing a real trend towards Eldrazi and Jund, and away from Infect and Dredge. Out of the tournament and with nothing else to do in Salt Lake City on a Sunday afternoon, I stuck around to see how it played out and to cheer on other Colorado players. We put three into the Top 8, two Burn and one Jund, but none of us went through. It’s not a particularly surprising Top 8. Jund, Bant Eldrazi, and Burn were the most popular decks at the tournament by quite a margin. With those kinds of numbers it would be weird for them not to make up almost the entire Top 8. The Tron player is the only unexpected deck, but I watched his run in Swiss and he was running really hot. What’s interesting is the final result. The Game Haven Sandy RPTQ sent the following decks to Pro Tour Aether Revolt. That…is significant. All the colorless decks went through. About that Eye of Ugin banning, wasn’t it supposed to reign in the spaghetti monsters? Yes, I know that Tron and Eldrazi are naturally favored against Jund, but that doesn’t explain why these decks thrived to such a staggering degree. The Jund and Burn players all fought through a lot of Eldrazi to get to that point and yet they all fell. For the most part, based on what I saw, it came down to variance. The critical round was when the Eldrazi decks drew well and the other decks stumbled. Tron just keep cruising through their Jund matchup. In a number of cases it came down to Ancient Stirrings finding the right card at the right time, to turn Worship back on and keep it there. Still, the raw power of the colorless menace cannot be denied. I’ve still got a lot of notes and discussions to go through, so expect more on this subject next week. Until then, if anyone has their own RPTQ experience I’d love to hear how you did in the comments. I’m a Merfolk player and in my opinion your issue was white splash. Otherwise I think you would have had a great finish. Running into the only Affinity deck is pretty bad luck though. Hey, I know I’m a bit late to comment but just wondering; how do you actually predict a metagame? I understand the premise, but not sure what the actual physical actions one would take to do this for paper tournaments. Especially when playing in a new city where you know none of the local players. The best method is to go to the site and see what players are playing. Nothing beats timely data, and even if the players you observe are not the opponents you will face it indicates where other players heads are. I went to the LCQ the day before the RPTQ to see what players were playing and it was a lot of Burn and Jund. I therefore assumed that the local players thought Jund and Burn were the good decks and planned accordingly. The other method for an invitational tournament is to look at what got them to that tournament. The old expression “Dance with the one that brung ya” tends to hold true to these things. I looked back on metagame data from the qualifying season and saw that Jund, Infect, Tron, Burn, and Bant Eldrazi were popular then, meaning that it was likely many who were qualified would be playing those decks. If they were winning then, it makes sense that many PPTQ winners would have played those decks. I was right in this case, though it is far from foolproof. This only works for relatively small tournaments. There’s too much variance at a big event. The best bet there is to look at the metagame breakdowns and hope for the best case scenario.